Nokia has experienced tremendous growth in its Lumia range line-up; however, until now, it had failed to match-up with competition, Android in particular has offered large screen devices including phablets as well as tablets. Recently, Nokia unveiled the Asha 500, Asha 502 and Asha 503 to its top rated budget portfolio; however users still demanded for more varieties in the Lumia range, therefore Lumia 1520 and 1320 couldn’t have come at any better timing. The two siblings comes with advanced innovations underneath including camera innovations so users can capture those special moments and share them. Fitted with a 20MP PureView camera, the Lumia 1520 has a lot to offer. The camera comes equipped with image stabilization capability allowing users to capture sharper images even in darker conditions. Besides the camera goodness, Lumia 1520’s large 6inch display panel offers vivid 1080p HD display for outstanding outdoor readability. Users can bring their videos to life with Nokia Rich Recording – an unparalleled audio capture feature that uses four built-in microphones. Onboard is Microsoft office that allows users to edit documents as wll as share them for maximum productivity. On the other hand, Lumia 1320 is equipped with Lumia’s high-end innovations and a similar sized 6inch display. It also comes with ad-free Nokia Music free streaming and HERE maps and location services. 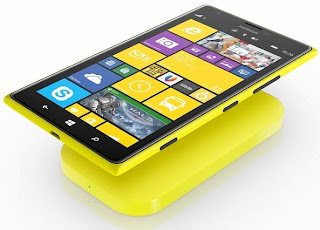 The Nokia Lumia 1520 will be shipped in yellow, white, black and glossy red flavors and is expected to start shipping in Q4 2013, with an estimated price of USD749 before taxes and subsidies in Hong Kong, Singapore, U.S., China, U.K., France, Germany, Finland and other European markets, with other markets to follow. No word on availability in Kenya and other African countries. The Nokia Lumia 1320 will be shipped in orange, yellow, white, and black flavors and is expected to start shipping in Q1 2014 with an estimated price of USD339 before taxes and subsidies in China and Vietnam, followed by other Asian markets, India and Europe. No word on availability in Kenya and other African countries.